Björn Meyer awarded the "Musikpreis 2018 des Kantons Bern"! Feeling honoured, happy, grateful, a bit dizzy but full of joy and inspiration! 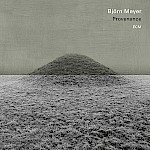 Provenance - CD/LP - Still out there! I am very grateful for all the lovely reactions – thanks to all for your warm support! The album is still very much available and I will definitely keep playing solo-concerts – see you there! The signed copies of Provenance have SOLD OUT .. but you can still get the music - Enjoy! NEN - our first release ever - Have a listen! Provenance - Digital - Online! Here is a link to all platforms .. just choose your favourite provider!